Gary Jobson and the Carolina Yacht Club hosted 80 sailors and their guests – including two AYC Buccaneer sailors (Chris Robertson and Emory Heisler) for the “Sail with Jobson – Fantasy Sail Weekend” December 3-5, 2010. Not to miss an opportunity to sail, Emory showed up a day early to sail with his Buccaneer skipper from 2010 Buccaneer North American Championships (BNAC) Captain Ray Dunn who also just happens to live in the Charleston area – proof once again that if you know a Buccaneer, you probably know someone in just about any port in the country! Arrrrr! 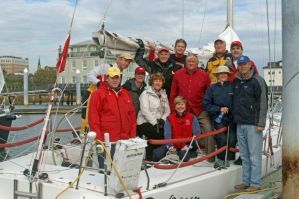 Along with an afternoon of sailing with Gary Jobson hopping from boat to boat, the weekend included many reminders about the Leukemia Cup Regattas, the Leukemia Lymphoma Society, and their shared mission to cure blood cancers. Attendees included at least half-a-dozen blood cancer survivors, but also was missing several participants from previous years that were not so fortunate to have the cure they needed for their version of the disease. Get your fund raising “hat” on for the AZ Leukemia Cup Regatta and next year you might be sailing with Gary Jobson in NEW YORK CITY!